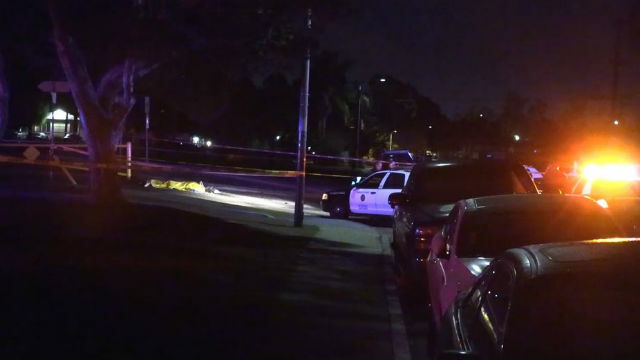 San Diego Police are investigating the early morning shooting death Saturday of a man in the Mountain View Neighborhood. An officer patrolling the area heard gunshots at 3:19 a.m. and about 10 minutes later another officer located the victim in a driveway of a park at 1200 South 45th Street. San Diego Fire-Rescue paramedics treated the victim, , a Hispanic man in his 20s or 30s, but he was pronounced dead at the scene before 4 a.m.
Detectives are searching for two men in dark clothing who were scene leaving the area in a white Volkswagen after the shots were fired. Anyone with information regarding the shooting should call the police homicide unit at (619) 531-2293 or San Diego County Crime Stoppers at (888) 580-8477.